Hmm….the average working age person has only about $79,651 saved up for retirement. That works out to about $416 per mounth of retirement payout if retiring at age 62. ICI recently released their retirement plan data through Q3 of 2012. 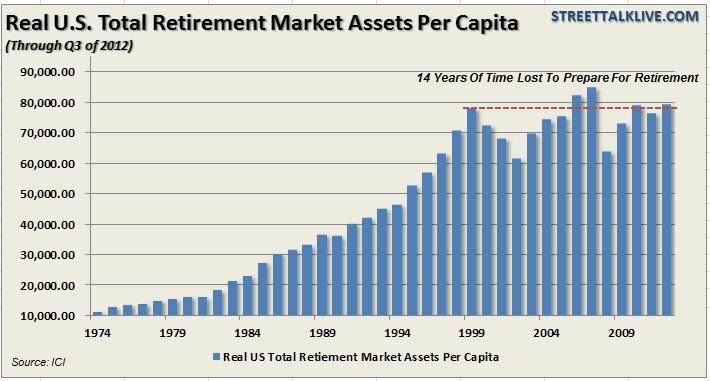 The chart of the day shows the real (inflation adjusted) total retirement market assets per working age citizen in the U.S. This includes IRA’s, defined contribution plans, private defined benefit plans, state and local government pension plans, federal pension plans, and annuities. The good news is that the liquidity induced rally over the last four years has finally, along with plan matches and contributions, recovered much of the lost value that occurred during the financial crisis in 2008. The bad news is, as shown below, that on average each working age person has roughly only $79,651 saved up for retirement and is no better off today than they were in 1999. There are two major problems that arise from this. The first is that for individuals trying to save for their retirement they have lost 14 years of irreplaceable time to do so. In 1999 an individual with 15 years to retirement had plenty of time to get there. That is not the case today as they stare retirement in the face and come to the realization that working through their golden years will have to be seriously considered. Secondly, consumption makes up roughly 70% of the overall economy. With incomes stagnant, and personal savings rates below 3%, the spread between the cost of living and incomes continues to widen. In turn, consumption is crimped keeping economic growth weak which exacerbates job creation, income increases and overall prosperity. With the average income at roughly $55,000 per year – retirees have little margin of error with only 18 months of incomes saved up in retirement plans.